Most of you have probably already gotten a chance to try out The Binding of Isaac: Rebirth, not only because it came out several weeks ago, but also because it’s free on the PlayStation 4 and the PS Vita this month for PS Plus subscribers. If you have not gotten a chance to play the dark and twisted twin-stick shooter yet, then I highly recommend picking up a copy of this somewhat disturbing game as soon as possible. I will be the first to admit that I was not impressed when it was announced that Rebirth was going to be a free November PS Plus game. It’s not that I thought it would be a bad game, it’s more that I thought it would be too redundantly similar to the many other indie twin-stick shooter titles on the PS Store. But, I downloaded the game anyway, and soon found out that it’s quite unlike any game I have played before. The main story of Rebirth revolves around Isaac, a seemingly young child with a religious-fanatic mother. She claims to hear the voice of God telling her to kill Isaac — sound familiar to any Bible stories at all? — and she resolves to prove her faith to God and follow through on his commands. Before she can kill her own son, however, he escapes into the basement. Alone, sad, and afraid, Isaac must now travel through the underground layers of his basement while confronting a whole host of monsters. Despite the incredibly disturbing story, however, the main focus of the game is actually on the gameplay itself. Rebirth is a twin-stick shooter, meaning players will be busily running around, dodging enemy fire and returning fire of their own. At the same time, I would also call the game a rogu-like title, as in it features randomly generated levels, various weapons to collect, bosses to fight, and the ever-challenging permadeath. Players take control of Isaac directly after he enters the basement. Players then have to start to explore the basement, entering different rooms and destroying the often-times creepy bad guys that live there. Isaac is able to shoot tears which is both sad and somewhat comical, but this main attack may be altered by picking up various power-ups. I found a whole host of power-ups during my numerous playthroughs, each one crazier, creepier, and more useful than the last. 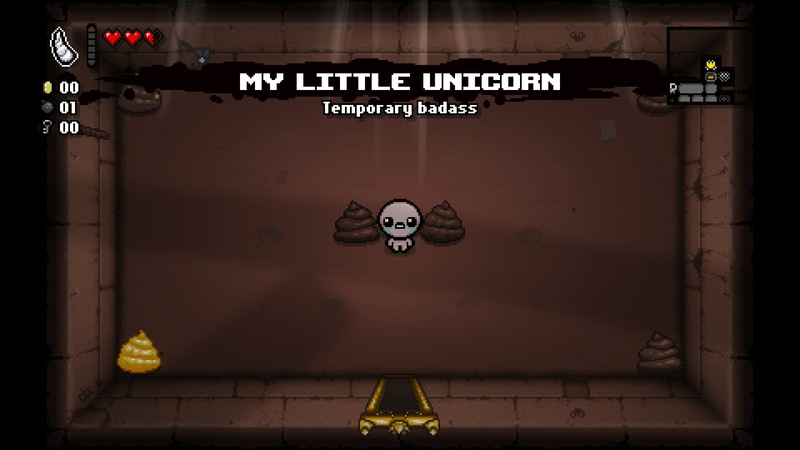 Some power-ups allow Isaac to gain vampiric abilities, another might let him shoot fireballs, while another still might give him a little helper that also shoots tears at enemies. As if that wasn’t enough, Isaac can also use various weapons, such as bombs or poisonous bombs to help him defeat the enemies in the basement. These generally run out, though, so players have to be careful as to when they should be used. Bombs, for example, will deal tremendous amounts of damage to bad guys, but they can also be used to clear debris that might be blocking a treasure chest, making the use of the explosive devices rather strategic. These extra weapons and power-ups are particularly useful in boss fights. Each level has a boss that must be defeated before Isaac can continue his journey and descend even deeper in the basement. The bosses are powerful, disturbing creatures that feature unique abilities. Some bosses can jump around, deftly avoiding Isaac’s attacks and also squashing him at the same time. Other bosses might just spawn minions that have to be quickly defeated. Boss battles are intensely fun and incredibly difficult, and, at least in my case, oftentimes result in Isaac’s death. This can be somewhat aggravating, as death is permanent in Rebirth and requires the player to restart the entire game. This, for me, made the game get repetitive fairly quickly, but that might not be the case for someone who doesn’t die quite as much. As players progress further into the ground and into the game itself, they may be able to unlock different characters to use. Characters can only be unlocked by completing certain tasks, such as beating the game without taking a certain amount of damage or collecting a certain amount of coins, which can be used in certain levels to buy bombs and refill Isaac’s health. Each character has different strengths and weaknesses, making a person’s playing style change greatly depending on which character is being used. Between the different characters, morbid and disturbing story, and intense, action-packed gameplay, The Binding of Isaac: Rebirth is definitely a game all PS4 and PS Vita owners should have. If you haven’t already downloaded it for free this month, I really think you should do so — you won’t be disappointed.